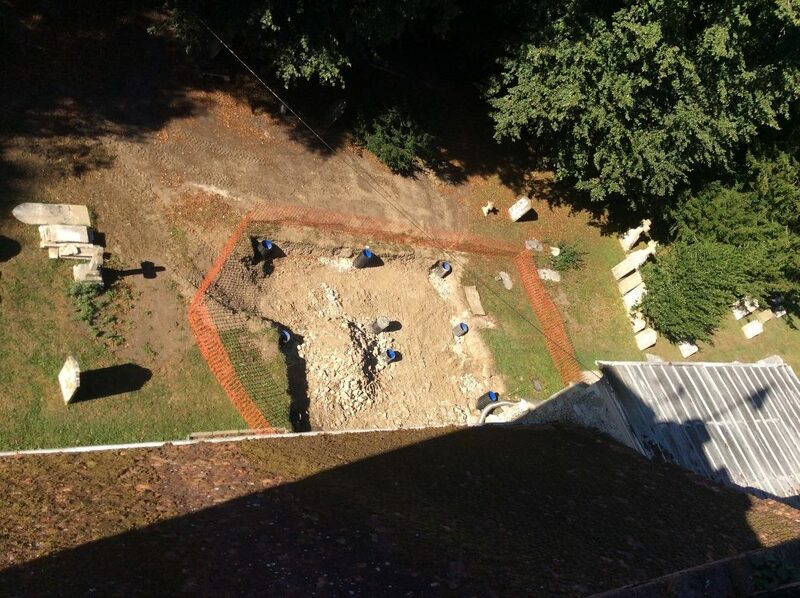 The large excavation in the picture is the result of the archaeological work successfully completed to satisfy the conditions necessary before building work on the Community Hub at Droxford Church could begin. This survey yielded good news that the build can go ahead with even less intrusion into the ground of the churchyard than originally thought. In early September you will see the hole disappear as the piles for the building are put in and the raft on which it will rest is completed. Once this phase of the project is complete the work on the building itself can begin. We are waiting for quotes for this next phase at present. Over a period of five years FODC has been raising funds; firstly to secure the fabric of the church to prevent its closure and secondly to gain permission and raise funds for the addition of a community hub at the church. Work to make the church safe and habitable was completed last year with very generous support from, amongst others, the Heritage Lottery fund. The church has been saved from closure. To make the church a more relevant building for the 21st Century, and to provide scope for additional revenue, the new build will include a dedicated meeting room for the Parish Priest, modern light catering facilities, lavatories and storage. More details in our leaflet. This will all cost some £300,000. We still need about £100k to get everything absolutely finished to support the activities, but with your help and generous support we will close the funding gap in the next few weeks and complete the construction of the Community annex early next year. If you’d like to donate to help us reach our target please visit our My Donate page to find out how. Visit the Website and/or follow our Facebook page.